My bubby was back. He was sweet. He complained about my chicken Parmesan but that's ok. They almost finished laying the tile in the playroom and will thoroughly finish tonight. Sunday(girl day alas!) 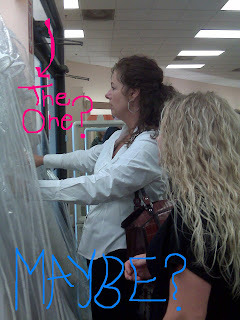 I went wedding dress shopping with Britt, her mama, and Mary Jane(Britt's best friend from childhood.) We watched as Britt tried on a few gowns and narrowed it down to the style she really liked. Maybe she found "The One? "She looked A-mazing! She also picked out our bridesmaid dresses and I would tell you just how beautiful they were, but I need to get permission first. It was nice to have a girl day, but after missing my bubs all week and then leaving all day Sunday, I was glad to be home with my little family. We snuggled up to a movie.